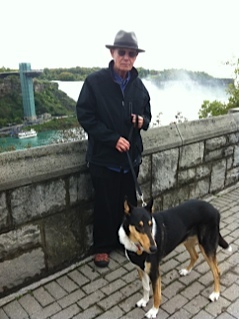 Determined to find inspiration for Syndic, LeRoy and Fergus drove from California to Niagara Falls Canada. They were not disappointed. On the drive back they discovered Santa Fe New Mexico and the inspiration they sought. Welcome to Syndic No.6 – the issue dedicated to the “spoken word”. Thirty-four authors/artists read aloud and interpret their poems, stories and memoir pieces; one artist sings her piece; three filmmakers create videos; and seven artists exhibit their art and/or photographs. Not a single chapter in Syndic No. 6 is presented using only the written word. I commend these authors/artists – especially the poets and the story writers – for being willing to step away from the comfort of the written word and speak their work aloud – some for the very first time! Change is difficult because it breeds insecurity and it feels risky. Thank you all for embracing the “spoken word”. Again, our Syndic international representation is good and continues to grow with each issue – authors/artists from Canada, Israel, Germany, Mexico, India, Japan, China, England, Poland and Austria are represented. Even our national representation is improving with this issue – New York, Illinois, Maryland, Colorado, and of course, our home base, California. The reach of the Internet is truly global and has the capacity to bring authors/artists together in one online presentation. What a world we live in! And for the future? The next issue of Syndic will be published August 1st 2012 with a submission deadline of July 1st. Submissions are welcome, but authors/artists – especially poets and writers – need to be aware of the journal’s emphasis on – and preference for – the “spoken word”. (1) Right click author’s “READ” link & (2) Click “Open In New Window” / (3) Click author’s “PLAY” link to activate narration & (4) open the new READ window.